The greatest player the chess world has ever seen has become a frequent visitor to our city lately, calling St. Louis “the world capital of chess.” But On May 16, Garry Kasparov's time wasn't all about chess, not directly. He visited Chaifetz Arena to deliver the 2015 Saint Louis University commencement address. His address focused on two key ideas. First, Kasparov compared graduation day to a day he calls “the greatest day of his life” - winning the World Chess Championship at the tender age of 22 (likely the same age as many of the graduates!). At Chaifetz, he emphasized that even though winning the title was the happiest day of his life, more great things are to come. 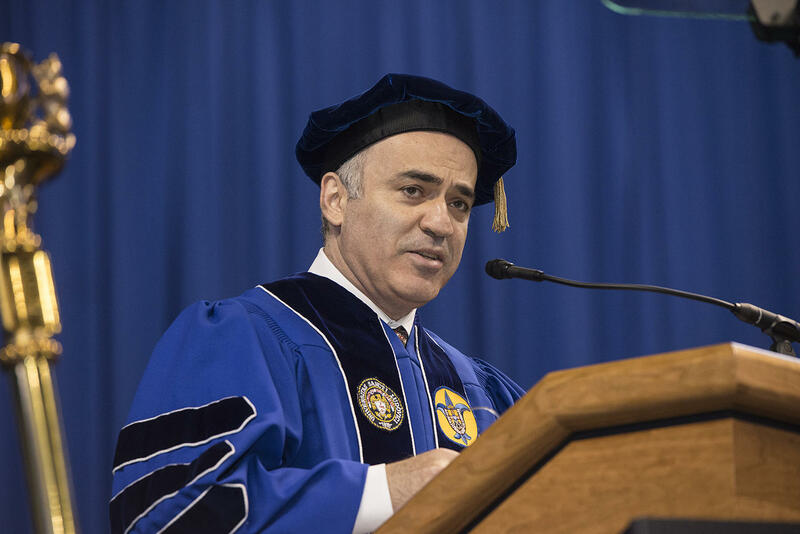 Garry Kasparov addresses graduating students at Saint Louis University. He shared an interesting story about a woman who approached him on that day: “‘Young man,’ she said, ‘I feel sorry for you.’ What? Sorry for me? Sorry for me? The youngest world champion in history, on top of the world? ‘I feel sorry for you,’ she continued, ‘because the happiest day of your life is over.’” He encouraged the graduates to set new goals and plans for the future. Kasparov delivered a great address. He congratulated the students on their hard work and achievement of earning their degrees. He also said, however, that once you finish such hard work and achieve your goals, there is always more to do and more to achieve - very inspiring stuff! In keeping with the youth theme, I can’t help but point out some other young people who will be coming to St. Louis in July. The U.S. Junior Chess Championship comes to the Chess Club and Scholastic Center of St. Louis July 6-16. The best in U.S. junior chess will compete to become champion of the class, earning an automatic bid to the 2016 U.S. Chess Championship. These games will be exciting, as they often are in junior chess, and many will tune in to see which young talent will enjoy the happiest day of his budding chess career; a day that will spark further dreams of competing with the world’s best, and potentially more happy moments. Grandmaster Ben Finegold learned the rules of chess at age 5 and was dubbed “The 40-year-old GM” after receiving the title in 2009. In between, Finegold was a U.S. Junior champion in 1989, a recipient of the prestigious Samford Chess Fellowship in 1993 and a competitor in nine U.S. Championships. He is a popular scholastic coach and commentator for elite events. A new multi-national chess competition aims to draw attention to the sport. 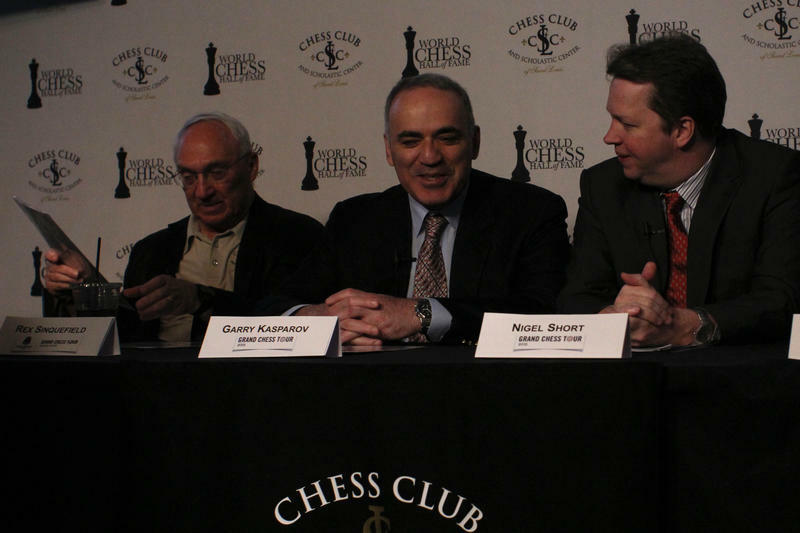 “Hopefully we are witnessing now the creation of the network that will greatly donate to the promotion of the game of chess,” said chess legend Garry Kasparov at the announcement. 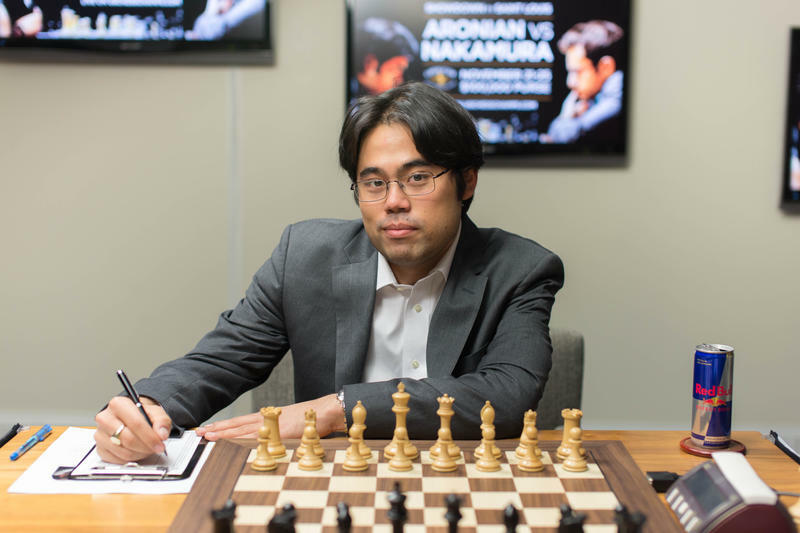 The Webster University challengers provided excitement in this year’s U.S. chess championships, but in the end the top ranking players — GM Hikaru Nakamura and GM Irina Krush walked away with the titles.